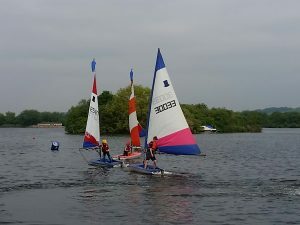 Saturday 4th June, a beautiful afternoon for sailing, saw 5 of the club’s under 18s on the water for the 4th race in their Cygnet Series and some fun aimed at improving their sailing skills, including sailing in reverse. What’s the point? Try leaving a busy pontoon or stopping and reversing your boat on the line before the race start! The next session, including Race 5, is on July 9th at 1.30pm.